Heat 75g oil in a pan. Fry Szechuan peppercorn over low heat for 2 minutes. Smash peppercorn to smaller pieces. Transfer to a bowl. Add dry red pepper and continue to fry over low heat for 1 minutes. Stir the oil frequently. Remove to a cutting board and chop it up. Transfer to the same bowl in step 1. Set the bowl aside for later use. Add cinnamon bar, star anise and bay leaves to the remaining oil in step 2. Fry over low heat for 1 minute. Add ginger, garlic and scallion segments to oil and continue to fry over low heat until scallion turns golden brown. Remove all the ingredients. Keep the oil for later use. Cut beef into thin slices about 5 cm long, 2-3 cm wide, 2-3 mm thick. Transfer to a medium bowl. Marinating beef slices: add salt (to taste), 1 tablespoon soy sauce, 1 tablespoon cooking wine, egg white, 1 tablespoon starch and a little water to the beef bowl. Marinate for 15 minutes. Stir-fry vegetables: add 2 tablespoon oil to another pan. Heat the pan over medium heat. Add bean sprouts and mushroom first. Then add celery, cabbage and garlic. Stir-fry until all vegetables turn super soft. Transfer to a plate. Heat the oil left in step 4 over medium heat. Add “beef-boiling sauce”- chili powder 1 tbsp, black bean paste 2 tbsps and 30g hotpot sauce. Stir well to avoid sauce sticking to the pan. Add 1 tbsp cooking wine and 2 tbsps soy sauce. Add 350ml water. 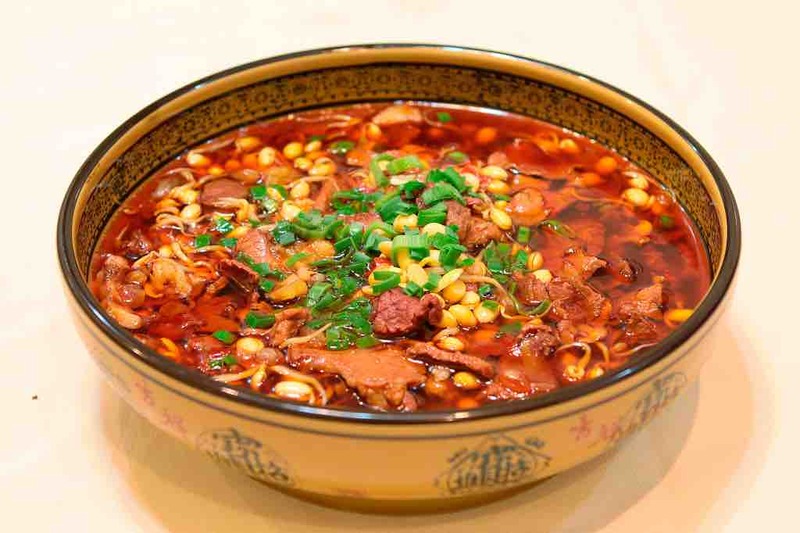 If you happen to have chicken or beef bone soup, add the soup for ultimate flavor. After the sauce is boiled, adjust the heat to low level and cook for 3 minutes. Remove all residues. Add stir-fry vegetables in step 7 and boil for 2 minutes to add extra flavor. Remove to a large bowl and set aside. Put beef slices into the boiling sauce one by one. Adjust the heat to high level. Once beef slices change the color, turn off the gas. Pour everything to the large bowl in step 11. Add peppercorn and dry red pepper prepared in step 1 and 2 to the large bowl. Add some more chili powder, chopped garlic and peppercorn powder if you want. Heat 30g oil in another pan over medium heat until it gets very hot. Pour the oil on top of the chili powder, peppercorn powder and chopped garlic twice, separately. Sprinkle some chopped scallion on the top. Ready to serve! I know it’s hard work, but it’s worth trying!